Students present on Native American religious traditions to guests at the annual OCU World Religion Expo. Each spring, students enrolled in OCU’s World Religion service-learning classes create and make presentations on major religions around the world. 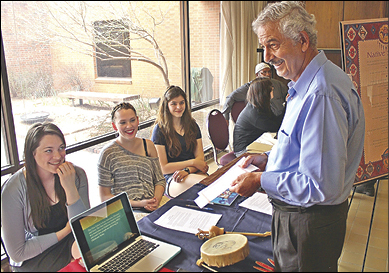 Each student chooses one religion, then develops a display, handouts, slide show, and talking points that are shared with people as they pass through the annual World Religion Expo on the campus in Oklahoma City. "Youth groups and Confirmation classes love the event," said Dr. Leslie Long, a faculty member involved in coordinating the Expo. "We always hear how great it is to learn so much in one setting." Creativity is rewarded with extra points, so the Oklahoma City University students tend to include flourishes such as music, art, and dance. "They are given a very simple list of the sorts of things that would be appropriate, and then they run with it," said Dr. John Starkey, who leads one of the classes. In their preparation, students visit leaders in the faith traditions they chose and enlist them as sponsors. The student also attends at least one worship service in order to give a first-hand perspective. The research is done over the course of two months, then students make their presentations at the Expo. "When participants arrive, they receive a passport to take with them from table to table to ensure they get to them all," said Starkey. "Student presenters are especially encouraged to have activities for younger participants." OCU religion major Melaina Riley, a junior, has had experience on both sides of the tables. "I came in high school, and then I helped present last year. What I enjoyed most was seeing that there were people of diverse faiths in our community. It really opened my eyes." The 2017 World Religion Expo is scheduled for Sunday, March 26, between 2 and 5 p.m. on the first floor of the Gold Star Building at the center of campus. The event is free, and no registration is required. Plan at least one hour to explore all the displays and talk with the student presenters.